The Markets saw a strong up move as it touched its fresh lifetime highs again fuelled by FII inflows and ended the day with robust gains. The Markets saw a positive opening and saw nearly one-way trend as it never really witnessed any selling pressure at any level during the day. After positive opening, the Markets saw itself trading with modest gains in sideways trajectory. Though it successfully maintained those gains, it saw fresh strength and strong up move in the second half of the session. It surged ahead and went on to move past its previous lifetime highs and formed a fresh intraday and lifetime high of 8707.90. It smartly maintained those gains and finally ended the day at 8695.60, posting a strong gain of 144.90 points or 1.69% while forming a sharply higher top and higher bottom on the Daily Bar Charts. The session is likely to remain a tricky and cautious affair for the Markets. The Markets, technically speaking, are expected to open and trade positive, at least in the initial trade. However, though it may continue to form fresh lifetime highs once again, some amount of consolidation is likely at higher levels. However, we may not witness any major profit taking, but the up move might be temporarily halted at higher levels. The Markets now trade in uncharted territory once again. The expected resistance levels can be 8710 and 8145 while supports exist at 8640 and 8565 levels. The RSI—Relative Strength Index on the Daily Chart is 68.9977 and it has touched its highest value in last 14-days which is bullish. 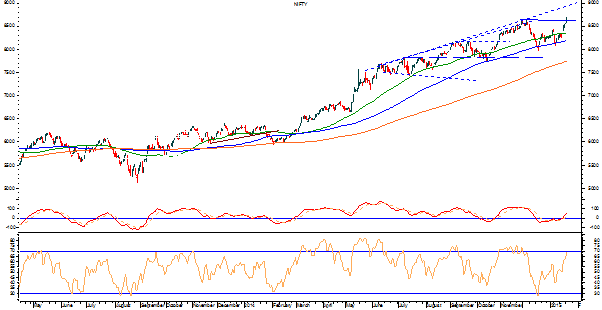 It does not show any bullish or bearish divergence. The Daily MACD remains bullish while trading above its signal line. On the Candles, A rising window occurred (where the top of the previous shadow is below the bottom of the current shadow). This usually implies a continuation of a bullish trend. There have been 8 rising windows in the last 50 candles--this makes the current rising window even more bullish. On the derivative front, NIFTY January futures have added a massive 16.68 shares or 8.27% in Open Interest. This is a very significant addition in OI which clearly implies heavy buying and creation of fresh long positions. Returning to pattern analysis, the Markets have moved past its previous lifetime high to form a fresh one. Theoretically speaking, the previous lifetime high is usually expected to pose some minor resistance before the Markets breaks out on the upside. Having this not happened, we cannot rule out some minor consolidation at higher levels. However, in the same breath, with the rally being highly liquidity driven, we can also expect the Markets to continue with its up move and show strength and this would be perfectly normal. Overall, with the trend remaining extremely buoyant and intact, one can continue to make fresh purchases on selective levels. At the same time, the profits on existing long positions too need to be vigilantly monitored. Overall, while remaining vigilant at higher levels, positive outlook is advised for the day.